Where I’m living, winter is fast approaching and the annual problem of dough proving at home is rearing up again. It doesn’t get too cold in Sydney in winter (compared to Europe or North America), but because of that very fact most of us don’t have central heating. The house can easily get down to between 5 – 10°C (41 – 50°F) overnight and 12 – 16°C (54 – 61°F) through the day, which is a little cool for bulk fermentation unless I extended the times beyond my schedule. Most of my bread dough has a DTO (Dough To Oven time) of around 24 hours. So in these cool environments my timings are thrown out. Of course, I could reschedule to extend the time frames but I really want it to fit my current times. So, with the last couple of batches of bread, I used the oven for proving the sourdough overnight and for the final proof the next day. The results were fantastic and most importantly – predictable! When Boris goes fishing in Tasmania he usually makes some bread for the guys in the lodge. He uses the cupboard where the hot water heater is located as his proving cabinet, and even proves his bannetons on the fireplace mantle piece. In Tasmania the temperatures in summer can be quite variable, getting very cold over night and during the day. However, for me, I’m having excellent results with my oven. The key thing is to test out your oven with your dough thermometer, making sure you know what settings to prepare the oven with. My oven starts numbering temperatures on the dial at 50°C (122°F). 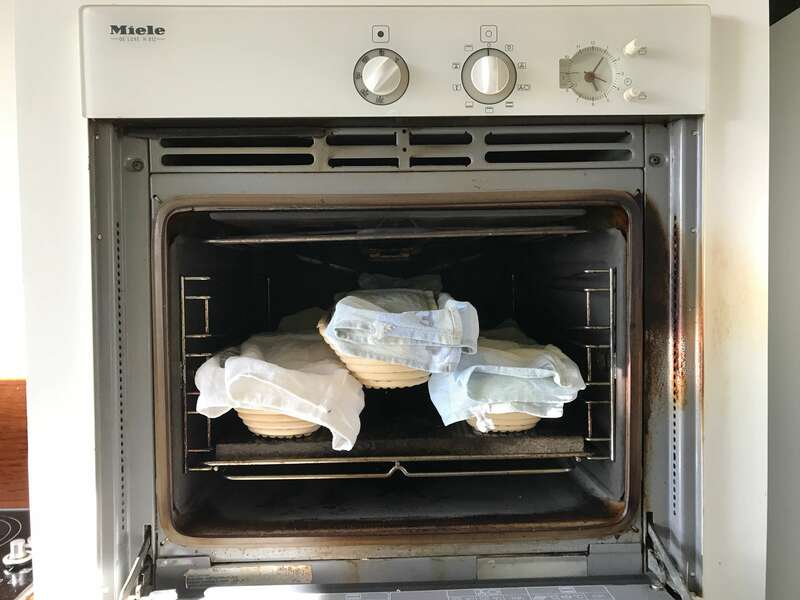 For my particular situation, I found that if I turned the oven on just before starting to prepare the sourdough or final dough; then when the thermostat does its first click (indicating the target temperature has been reached), I turn it off. By the time I’ve finished making the dough, the oven temperature has settled to where I require it. I can then put the dough into the oven (my own personal prover/fermentation cabinet). My oven has a stone inside so it holds the heat for a long time and with the natural insulation of the oven, it all helps to maintain the temperature for longer, giving a better fermentation result on account of the temperature level and stability. Of course the temperature drops when you put the cool dough into the oven. It also cools a little more as the oven is opened again. This is why I set the initial temperature a little warmer to offset this so it lasts the distance. The temperature will still decline over time, but at a much slower rate (due to the thermal mass of the stone and oven insulation), so it will usually last the distance very nicely. It’s vital that you do not leave the oven on while the dough is inside. Residual heat in the stone and oven body is more than enough. Always keep the dough covered to avoid the dough developing a skin. Put a note over the oven dials. 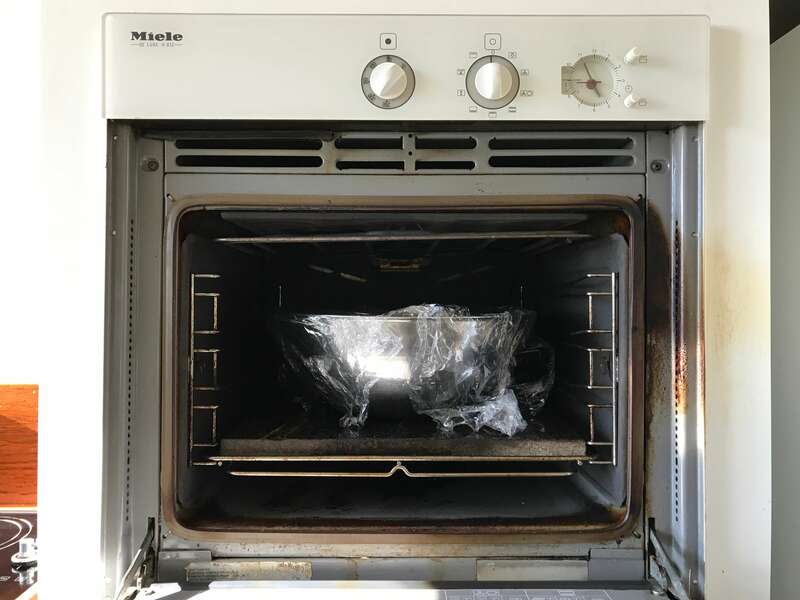 The last thing you want is someone turning on the oven to preheat (without checking inside) before doing some other cooking/baking – the result could be very ugly. Of course you’ve all been doing this from the start and it’s just me that’s catching on now. I’ve done this too. You have another weapon in your arsenal – the oven light if you need it a little warmer. Though I don’t need to use my oven I don’t use my room temperature counter top either. I make a big batch of dough, throw it in the fridge and pull off what I need when I need it. Burns, that’s another great idea. Heating pads also work great. They are basically miniature versions of electric blankets. I’ll tuck them over the bowl or rest them under a brotform depending on watch stage I’m at.